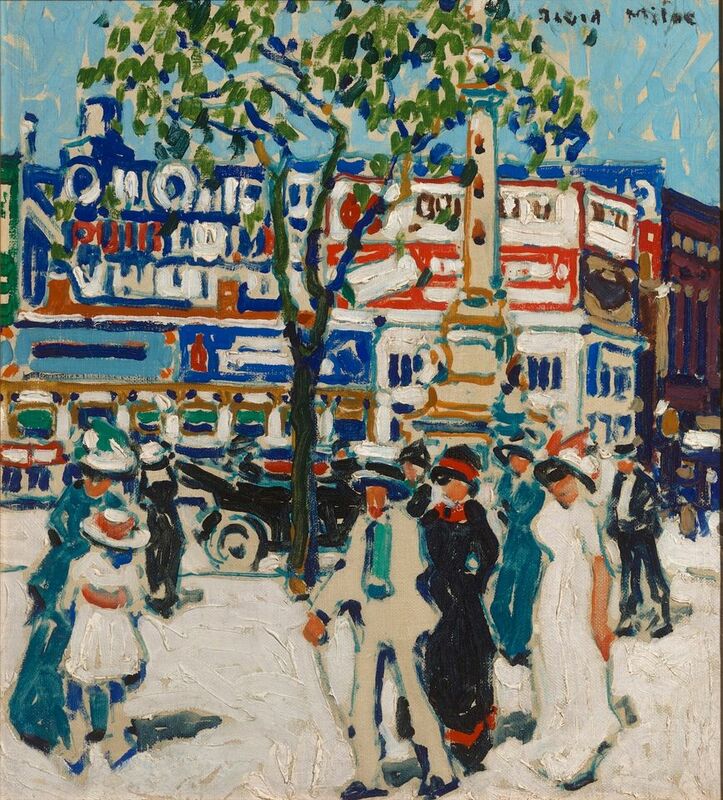 It is the Canadian Modernist David Milne's turn to take centre stage at the Dulwich Picture Gallery (until 7 May). (The show follows the gallery's earlier exhibitions on Canadian art in 2011 and 2014: Painting Canada and From the Forest to the Sea: Emily Carr in British Columbia). The museum is showing a choice selection of the artist's oil paintings, watercolours, photographs and drawings in the first major UK survey on Milne (1882-1953). "Although he was influenced by artists such as Monet and Cézanne, you would struggle to find these influences in his work," says the show's co-curator Ian Dejardin, who left the Dulwich in 2017 to become the chief executive of Ontario's McMichael Canadian Art Collection. "He was always his own man and has his own distinct language," he says, adding: "No one looks like Milne." Shades of Suffragette Militancy (25 April) at the Museum of London is among the many exhibitions organised throughout the UK to celebrate the centenary of female suffrage and the passing of the Representation of the People Act 1918, which gave some women the vote for the first time. This particular show focuses on the suffragettes as militants, organisers and inspirational speakers, and includes a selection of objects such as the chains worn by Muriel Matters when she and fellow suffragette Helen Fox chained themselves to a grille in the UK House of Commons in order to tell the story of these remarkable women. This weekend is the last chance to catch the Chisenhale Gallery's solo show of work by the artist Lydia Ourahmane (until 25 March). The exhibition draws on personal and family experiences and extensive time spent by the London-based artist in and around her family's home in Oran, Algeria to address wider issues of displacement, immigration, absence and presence and charged spaces. You don’t get much more visceral than having one of your works of art drilled into your skull and the show’s main talking point has been the pair of gold teeth, one mounted on the gallery wall, the other permanently embedded in the artist’s mouth. (Both were made by melting down a gold chain purchased by the artist in Oran for €300—the price of a boat passage from Algeria to Spain. They also relate to the fact that Ourahmane’s grandfather had all his teeth removed in order to avoid being drafted into the French army in the Second World War).